Tomatoes are the passion of many a home gardener. Once you’ve gotten a taste for homegrown tomatoes fresh off the vine, it’s hard to go back to the supermarket produce rack. There’s no reason to settle for bland, homogenous grocery choices when you can grow a wide assortment of flavorful varieties at home. 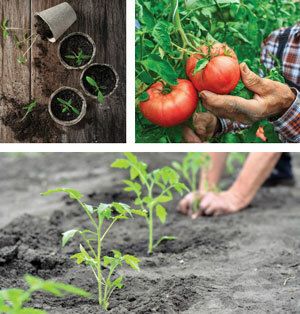 Before you can choose your tomato varieties, you need to assess options for where to plant. Tomatoes are flexible, and can be grown in the ground, in raised beds, or in containers. But they do require a certain depth of soil, and most importantly, tomato plants need at least eight hours of full sun. It doesn’t have to be eight straight hours, though—it can be broken up into morning and afternoon hours. If you have a large backyard with a sunny area, you can plant directly into the ground or build a raised bed, which is a great way to control soil composition. If not, look for any area with enough sun, even the patio, driveway, or dock, and plan to use containers. There are two major types of tomatoes: determinate and indeterminate. Determinates grow to a certain size, bear fruit, and then stop growing and producing. They are perfect for smaller or medium-sized containers. An indeterminate will continue to grow, flower and bear fruit until frost or disease kills them, so it’s great for planting in the ground, raised beds or larger containers. 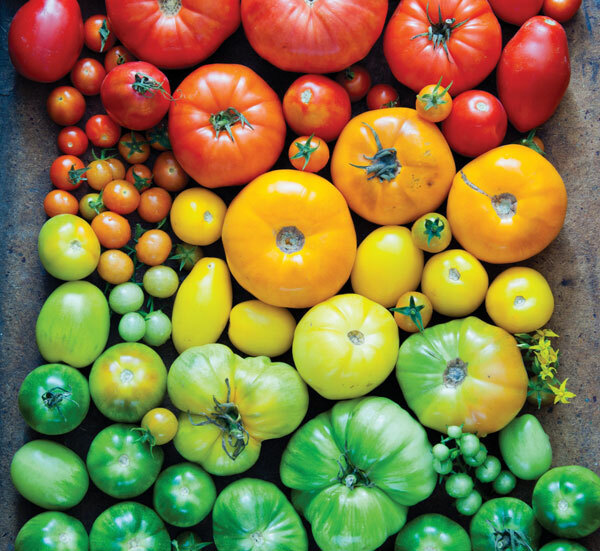 As for varieties of tomatoes, visit your local garden center to see what choices are available. Be adventurous! Shop around for the greatest variety. Most garden stores will have a selection of disease-resistant hybrids as well as a few tender but delicious heirlooms. Read the descriptions of each variety, paying attention to whether it’s determinate or indeterminate, and the length of time from planting to harvest. Select a range of plants, from early harvest varieties like Early Girl, to later, larger heirlooms like the classic Brandywine. And choose both tougher hybrids and more delicate heirlooms to hedge your bets. If bad weather wipes out your more tender varieties, you may still have your hardier plants. However, you should make your selection based on where you can grow them. If all you have is medium-sized containers, you may not be able to grow larger varieties. 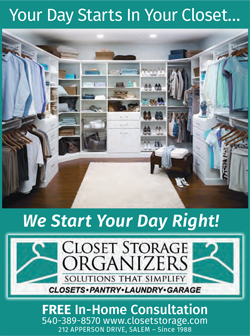 But if you have a lot of space or larger containers, you can choose almost anything. 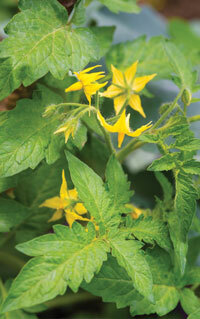 While selecting your tomatoes, buy some companion plants as well. Basil is a traditional companion plant, because the fruit and herb go well together in a myriad of dishes. But you can also grow flowers like marigold, which helps repel insects and provides a sharp burst of color to make your containers pop in summer. Or slip in a few pepper plants like jalapeños to plan for fresh salsa later in the season. When it comes to soil depth, the bare minimum you can get away with for tomatoes to ensure solid root growth is 10 inches deep, in either a container or raised bed. A full foot is better, but the deeper the roots the larger the fruit will grow, so always try to give your plants the maximum space possible. Additionally, the larger the container—or the larger the area you can plant in—the less watering is needed. If you have tillable garden space, you can put your seedlings right into the ground. You should loosen the soil to a depth of about six inches, working with soil that is slightly damp but not wet, and mix it with compost and fertilizer as you till. If you have the means and the energy, consider building some raised beds to allow for better soil control and minimal weeding. Make sure the sides of the raised bed will allow for at least 10 inches to a foot of soil, and fill it with high-quality container soil, including compost and fertilizer. Raised beds will still need watering, but they will require less tending and weeding. If you have no garden space to dedicate, no worries. Containers are fantastic for growing tomatoes and can be set up wherever you have enough sun. You can buy large, decorative pots, and combine with basil, marigold and pepper plants to make a decorative but (mostly) edible arrangement. You can also buy larger elevated beds, like the popular VegTrug, that provide deep soil, but at waist level, which makes for easy gardening. Just make sure to keep them watered. The generally accepted date to begin planting in Virginia is after April 15. That’s historically the last date for any hard frost that might kill your seedlings. Gardeners who are willing to cover their seedlings with burlap or plastic in the event of a frost can get a jump on the season and plant a few weeks early. When it comes time to plant, you can give your seedlings a head start with a few easy tricks and tips. You should “harden off” seedlings for a few days by letting them stay outside during the day, but bringing them in at night. That will acclimate them before they are planted. Tomatoes will grow roots from anywhere on the stem. That means you can plant leggy seedlings horizontally with the top peeking out of the dirt. The roots will start to grow off the stem, and give your plants a great head start. Plant on a day where the weather is mild. Not too hot, not too cold, not too windy and not too sunny. A calm overcast day is ideal. After planting, water them generously, and then keep soil moist throughout the season. Tomato plants that are subjected to uneven watering, with extreme wet and dry periods, can develop blossom end rot, where fruits have black bottoms. Aim to keep soil moisture as even as possible. You should also fertilize, starting when the first fruits set and continuing about every two weeks throughout the season.